Howdy and welcome to Sundays With Celia Vol 75. I hope you’re enjoying a lovely Sunday. I actually had a bit of a slow, relaxing week. 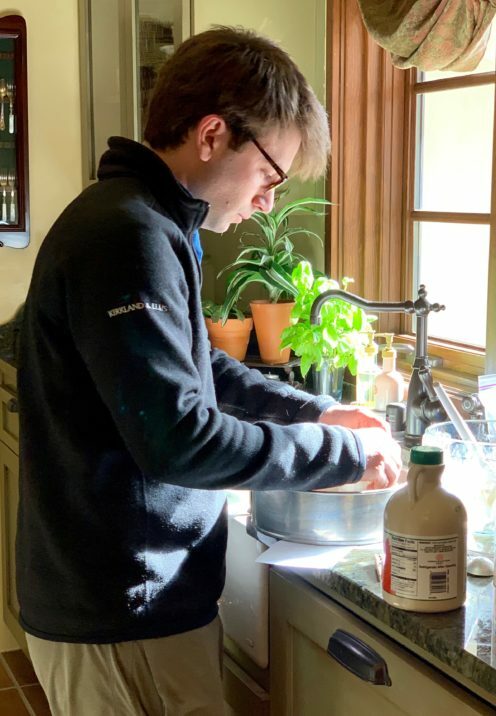 It was terrific having my Chicago dwelling son here for a visit, so it made for a great, long holiday weekend last weekend, and a short week this week. All of my boys like to cook so he and I did a little cooking together. It was Grandma Nellie’s Birthday so we brought lunch over to my parents house. 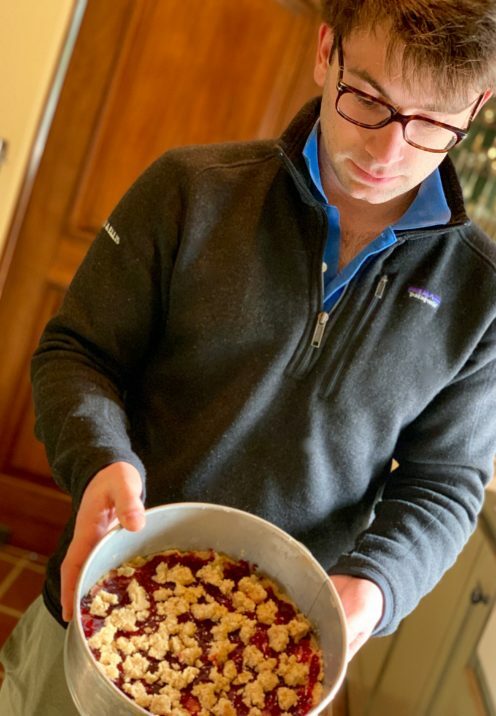 And instead of a birthday cake my son made his grandma a recipe that was published last week by Joy The Baker for Almond Flour Crumble Bars. 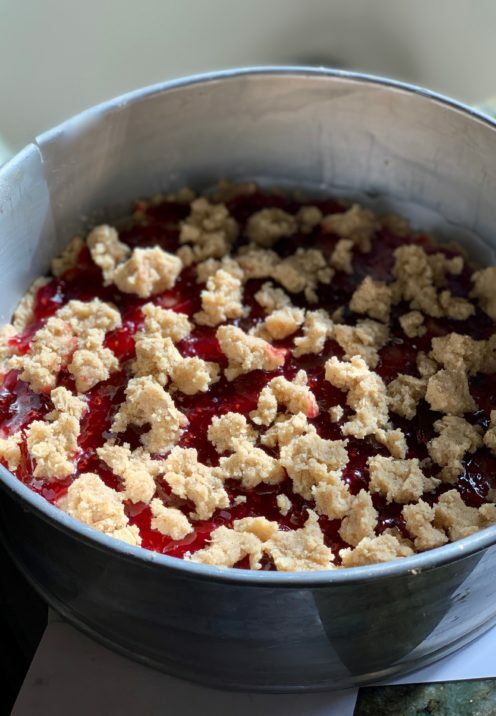 Joy made hers with Strawberry Jam, he changed it up a bit and made his with Raspberry Jam. Here it is ready to go into the oven. It was very yummy, gluten free and almost healthy, made with oatmeal, almond & coconut flour and maple syrup. Get Joy’s recipe here. We also paid a visit to a neighbor while my son was here. We met these neighbors 21 years ago when we purchased our first home (a second home at the time) here in Lake Arrowhead. I know that I met them 21 years ago because we met as I was walking with my son and pushing his newborn younger brother in his stroller the week after his birth. We had come to our Lake Arrowhead home to rest and recover after I gave birth. Every year after that these particular neighbors invited us to join them on New Year’s Day for Black Eyed Peas, a Southern tradition (she’s from Kentucky). Every year we went, and as a hostess gift I brought them the annual White House Christmas ornament. Well, this year the neighbors are getting older, (he’s 92 and she’s the best looking 80 something woman you’ll ever meet) and they didn’t have their annual New Year’s get-together. So we paid them a visit and brought them this year’s White House Christmas Ornament, albeit a little late. Well, look what she showed me during that visit! 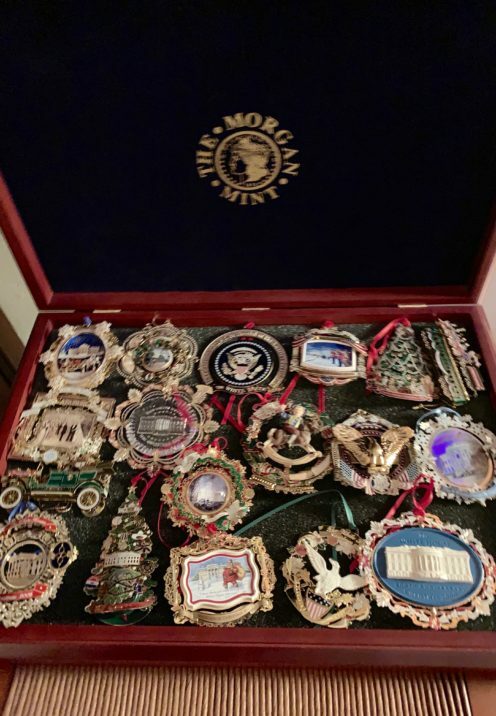 Her cherished box of 20 years worth of White House Christmas ornaments. If that didn’t make me feel awfully good. So, now my son is back in VERY COLD Chicago, hitting the law book instead of the cook books, and I’m missing him. This week I prepared one of my family’s favorite meals. 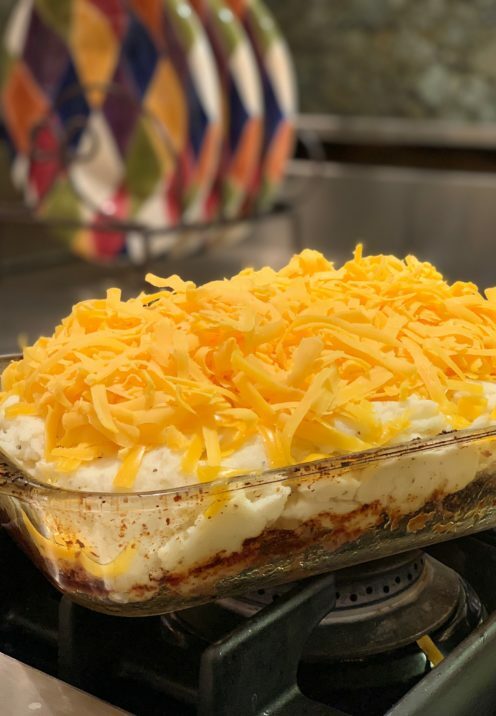 It’s my recipe for Meatloaf With Cheesy Mashed Potatoes. 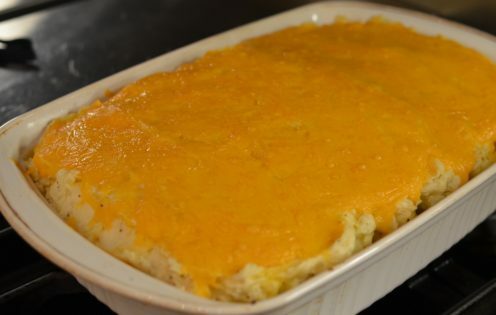 The meatloaf is covered in mashed potatoes that are then smothered in loads of cheddar cheese that then gets melted on top. I’m telling you, it is guaranteed to please. Now that we are empty nesters I cut the yummy recipe in half because it’s just the two of us. But this recipe is great for leftovers because it keeps well in the fridge for several days. And if you’re serving a crowd the full recipe is perfect. Plus it’s a one-dish-wonder. All you need is something green on the side and call it good. So last Sunday many of us watched our moon turn red as it experienced a total eclipse. Well, this Sunday I wanted to remind you, if you don’t already know, that National Geographic returned with Season 2 of its series about the Red Planet of MARS. Season 2 actually debuted back in November, but I just got around to watching the second season of this part documentary, part science fiction series, and I loved every minute of it! According to National Geographic, the six-episode first season was seen by 36 million viewers globally, and was their most DVR’d series in network history. I’m not at all surprised by those statistics, as it was really, really good. As a Documentary MARS blends elements of real interviews with real people like Elon Musk and Neil deGrasse Tyson with a fictional storyline set in 2033. Produced by Ron Howard and Brian Grazer, (always an indication of goodness) season 1 told the fictional story of a group of astronauts as they land on the planet Mars. Season 2 is more about the colonization of Mars and how “privatization” and “exploration for profit” intersects with “scientific” exploration. Watching season 2 really made me think seriously about the sustainability of life on planet Earth, as we face climate change and battle very real fires, floods, and drought right here in our own backyards. For me it was a real wakeup call about just how fragile and precious our home planet is, and why we need to protect it, lest we’ll be living on Mars sooner rather than later. As I get older I’m taking stock of my bucket list and examining those things that I’d really like to experience before I die. Thankfully my husband likes to travel as much as I do and we likely both inherited our travel bugs from our parents, who also loved to travel. 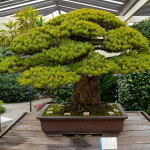 Brad’s parents were passionate about traveling by rail and had taken train journeys on every corner of the globe, including every single itinerary offered by the famed Venice Simplon-Orient-Express. So it’s no surprise that Brad and I have designs on doing the same one day. The iconic trains of the Venice Simplon-Orient-Express are located in some of the world’s most exciting and beautiful destinations. You can ride the rails in unparalleled luxury and unforgettable style in Europe, Asia and South America. Just imagine stepping aboard one of these historic carriages and being suddenly whisked back into the golden age of travel. These trains epitomize the glamour and elegance of the way travel once was, but sadly for the most part, no longer is. Just imagine being helped onboard by a steward in blue and gold livery, with a white-gloved hand and a knowing smile. For he knows you are about to have the time of your life. I imagine sliding open my compartment door to a suite draped in plush fabrics, paneled in rich polished cherry wood, with sumptuous upholstery and antique fixtures. I can see myself settling in and sitting back in that lovely chair as my grand adventure begins. I envision myself making my way to the cocktail lounge where crystal glasses clang as we toast to our adventure. We would imbibe on a delicious cocktail while enjoying the onboard entertainment, as the beautiful countryside glides by. As the sun begins to set we’d make our way to the elegant dining carriage, where crisp white tablecloths set the scene for an evening of exquisite fine dining. Stewards trained to perfection would serve us fine caviar and other culinary delights, accompanied by fine wines with every course. Finally, as our journey came to an end, I’d do what I do every time I travel. I would try my best to preserve the memory and to appreciate the experience. For I know that it would be so bitter sweet to have to depart the train, and check one more wonderful experience off my bucket list. Here’s a great little 8 minute video I discovered that let’s you experience what it’s like to spend 24 hours aboard the Venice Simplon-Orient-Express. ENJOY! All opinions expressed in this post are my own. 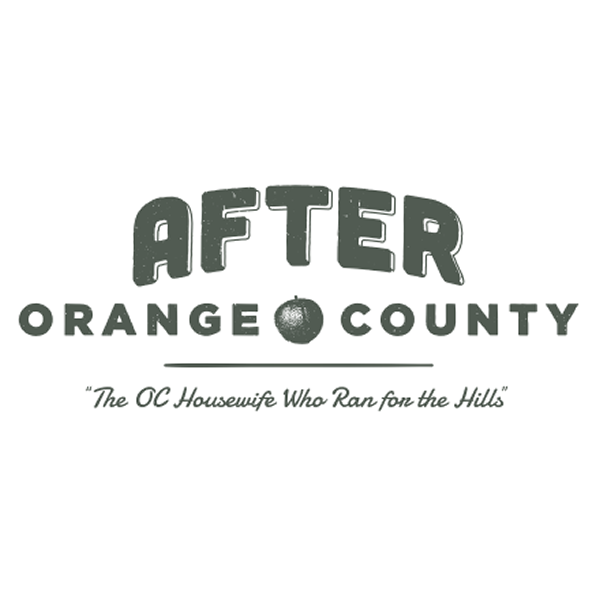 Unless otherwise noted, all photos are the original property of Celia Becker @ www.AfterOrangeCounty.com and may not be reproduced without specific permission. All photos of the Venice Simplon-Orient-Express Via.